Argentine sports magazine El Gráfico, a classic that ceased publications in January 2018 after almost a century in print, ran with the headline Vergüenza – disgrace. Unusually for a magazine cover there were no images; instead, the text was laid to rest over a black background, a colour typically related to mourning. 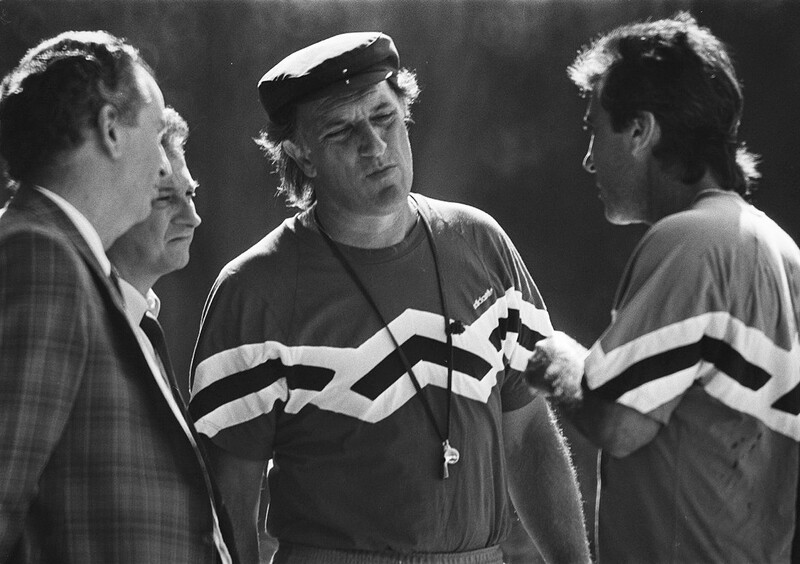 The cover posed questions such as “Should Basile resign?” and “Maradona: guilty or innocent?” The September 1993 issue was an in-depth, no-holds-barred autopsy of the corpse that was Argentine football. In December 1992, FIFA released the very first version of their rankings which, despite at times proving problematic and controversial, do allow nations to see, more or less, where they stand in the football hierarchy. In August 1993, the first update of the rankings appeared, placing Argentina as the fifth best football nation in the world. This wasn’t without its merit and their position perhaps could, and should, have been higher. Argentina won the World Cup in 1986, only losing the 1990 final courtesy of a West German penalty; the Copa América in both 1991 and 1993; and the King Fahd Cup in Saudi Arabia in 1992, a competition that would later morph into the Confederations Cup. Colombia were ranked 19th by football’s governing body. However, going into the game Los Cafeteros topped their CONMEBOL group by one point, aided by a 2-1 win over Argentina in the sweltering Caribbean port city of Barranquilla that ended a 33-match unbeaten run which stretched back to the 1990 World Cup final. Colombia knew that a victory, or even a draw, in the Buenos Aires return fixture would seal their place at the tournament in the USA and provide their nation with a real tonic given the unstable situation at home. Although Colombia were unbeaten in the qualifying campaign thus far, the signs were ominous: Argentina had never lost a World Cup qualifier on home soil. The stakes were high in the winner-takes-all clash. The loser was likely to finish in second place, forcing them into a winnable yet gruelling two-legged tie against the winners of the Oceania section, Australia. For Argentina, a defeat coupled with a Paraguay victory over Peru, with a four-goal swing, would dump them out of the running altogether. The side that faced Colombia on the cold Sunday evening of 5 September 1993 was strong, featuring eight members from the victorious Copa América campaign from just two months previous – Sergio Goycochea, Óscar Ruggeri, Jorge Borelli, Ricardo Altamirano, Gustavo Zapata, Diego Simeone, Fernando Redondo, and Gabriel Batistuta. Julio Saldaña, a defender who transferred from Newell’s Old Boys to Boca Juniors in 1993, Leonardo Rodríguez, who would go on to have a short spell with Borussia Dortmund, and River Plate forward Ramón Medina Bello made up Alfio Basile’s starting XI. Francisco Maturana, in his second spell as Colombia manager, set his team up in a bold 4-4-2, with the explicit instruction to get the ball to the influential Carlos Valderrama. Óscar Córdoba, the youngest Colombian on the pitch at just 23, would go on to have the game of his life and years later would be back in Buenos Aires, starring for Boca during their golden spell under Carlos Bianchi. He was standing in for René Higuita, the architect of the Scorpion Kick against England in a 1995 Wembley friendly, who was in prison for becoming embroiled in the Pablo Escobar maelstrom. The Colombian contingent received a traditionally intimidating welcome, harassed the minute the plane touched down at Ezeiza Airport, during their hotel stay, and even en route to the stadium on the evening of the match. Once out on the pitch, the players were forced to wait as ticker-tape and vitriol emanated from the stands. It was exactly the same tactic used, with great success, against the Netherlands 15 years earlier as Argentina won the World Cup in the very same venue. Argentina came close within the first couple of minutes through Batistuta, although the first half an hour of the game mainly resembled a war of attrition rather than a football spectacle befitting the stage. An inordinate amount of fouls were given by the Uruguayan referee as war raged in the middle third of the field, no love lost between two sets of players who shared two feisty draws in the recent Copa América. Argentina were keen to showcase their superiority over what they perceived to be a lesser-light of South American football; Colombia were hell-bent on revenge against their arrogant opponents and wanted to show the world that they belonged at the highest level. 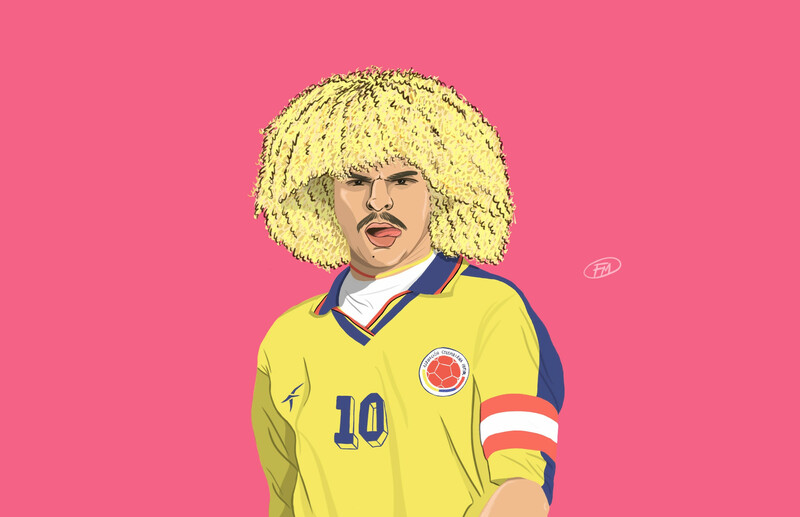 After 41 minutes Colombia launched a long throw-in deep into Argentine territory, and the cleared defensive header was picked up by the frizzy-haired icon Valderrama. Displaying a trait shared by playmakers of the highest order, the former Montpellier man used his body shape to befuddle three opposing defenders, which opened up space for him to slide the ball into the path of Freddy Rincón. The striker caressed the ball with a perfect first touch, and his blistering pace allowed him to pull clear of the defence before he rounded the goalkeeper at full speed and rolled the ball into the net. Five minutes after the restart, Colombia doubled their lead through Faustino Asprilla with Rincón, who would later represent Napoli and Real Madrid, turning provider. Colombia once again won the second ball following a defensive header, and Rincón lofted a long diagonal pass accurately into the path of the over-indulged and often wayward Asprilla, who found himself one-on-one with Jorge Borelli. A drop of the shoulder, and a shimmy from his seemingly elasticated legs, freed the future Newcastle hero from his marker, allowing him to slide the ball under the onrushing Goycochea and produce the flamboyant cartwheel celebration that became synonymous with his spell on Tyneside. Argentina had to go for broke and pressed the action, coming close on several occasions. As is often the case with teams chasing a lead, the levels of exhaustion and disillusionment grew and gaps appeared at the back as Argentina poured forward in search of a lifeline. After 74 minutes Rincón took full advantage, scruffily hitting a volley into the ground. The wrong-footed Goycochea could only watch as the ball bobbled past him. With Colombia leading 3-0, Paraguay equalised in Lima to make it 1-1. One more goal for the Paraguayan’s would bring to fruition the unlikely scenario that would see Argentina failing to qualify for the World Cup. Two minutes later, a lazy Borelli pass was intercepted by Asprilla who joined his teammate Rincón on two goals apiece, notching the goal of the night. The Parma forward, just inside the 18-yard box on the left-hand side, opened up his body in order to curl the ball over Goycochea’s head and into the far corner of the net, the nonchalant arrogance of a world-class player at the top of his game. This time the celebrations were wilder, the Colombian players in no doubt as to the magnitude of their performance; staff joined in and a pile-on ensued near the corner flag. Gleeful photographers gathered around the throng of bodies, their flashbulbs illuminating the running track surrounding El Monumental’s pitch, capturing the seminal images. Peru and Paraguay were now drawing 2-2, and with Paraguay just a goal away, the whole qualifying group was on a knife-edge. The final dagger soaked the sky blue and white shirts in thick, red blood. 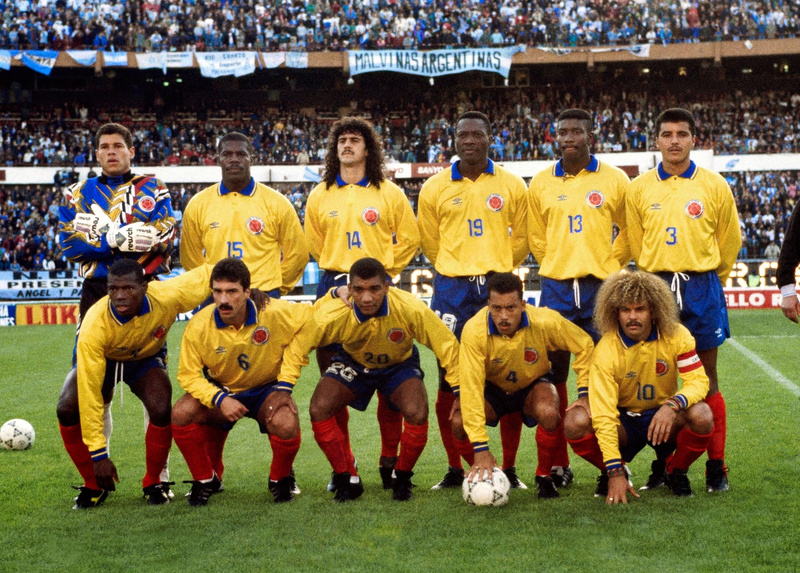 Valderrama dictated the action, as Colombia played keep-ball in tight spaces. El Pibe then upped the ante, launching an audacious outside-of-the-foot pass down the left-wing into the path of Asprilla, who fooled three Argentine defenders with a cleverly disguised pass. The excellent run of Bayern Munich star Adolfo Valencia was rewarded, and El Tren dinked the ball over the advancing Goycochea to make it five. Ernesto Filippi blew the full-time whistle and history was made. There were no more goals in the fixture between Peru and Paraguay; Argentina could breathe a sigh of relief – although that was the last thing on their minds. Argentineans may be as bitter and caustic as the rest of us in the wake of such a harrowing defeat, but they love their football enough to know when to salute an extremely impressive performance from an individual or team. Colombia’s players were given a standing ovation as they left the pitch, a stark contrast to the reception that greeted them on the way out of the tunnel at the beginning of the match. Many likened Colombia’s performance in only their third ever victory over Argentina to a prime Brazil. The result was a welcome tonic given the carnage happening at home as Pablo Escobar waged war on the state and anyone else who stood in his way. Yet that didn’t prevent almost a hundred people from dying during the celebrations in Colombia, with many more injured, during a time where life appeared too cheap. In the midst of the turmoil, Colombia just wasn’t ready for such a wildly unexpected success. Following the defeat, Alfio Basile remarked: “I never want to think about that match again. It was a crime against nature, a day when I wanted to dig a hole in the ground and bury myself in it.” Surprisingly, given the usual trigger-happy nature of Argentine football directors, the coach kept his job following the debacle and was allowed a stay of execution to take the team into the intercontinental playoffs. The defeat against Colombia, by a five-goal margin, was the heaviest suffered by Argentina for 35 years, when a 6-1 reverse to Czechoslovakia in the opening fixture of the 1958 World Cup in Helsingborg changed the course of their footballing history. The embarrassment in Sweden led to the abandonment of the La Nuestra ideals that had characterised the previous 20 years. Free-flowing, exciting, goal-laden football was replaced with a more physical, pragmatic approach as the national team, and its clubs, sought to keep pace with their European counterparts. This approach led to some brutal encounters involving the Argentine sides, famously in the Intercontinental Cup including several matches against British outfits. Diego Maradona, who witnessed the momentous defeat against Colombia from the stands after walking the 10 blocks to the stadium from his apartment, was recalled to the national team by Basile for the two-legged playoff with Australia. Maradona had left Sevilla in June but returned to Argentina to officially join Newell’s Old Boys on 9 September, just four days after the match. Maradona embarked on one of his classic fitness regimes and it showed in the first leg; he looked lean and determined as he fought for the ball before crossing for Abel Balbo to head in. The game in Sydney came just a day after his 33rd birthday. Argentina returned to Buenos Aires with a 1-1 draw, beating the Australians 1-0 at El Monumental to join the trio of South American nations that had already qualified for World Cup USA 1994: Colombia, Bolivia and Brazil. However, the legacy of the tournament for both Colombia and Argentina is shrouded in infamy, more for events which happened off the pitch as opposed to on it. Not for the first time, the prediction of the Brazilian icon was wide of the mark. Colombia finished bottom of Group A, losing their opening match 3-1 to a Gheorghe Hagi-inspired Romania, before succumbing to a surprise 2-1 defeat at the hands of the USA. The host nation’s opening goal came from the boot of unfortunate Colombian defender Andrés Escobar – no relation to drug kingpin Pablo whose reign of terror was brought to a halt under a hail of gunfire in December 1993. The footballing Escobar’s fate would soon match that of his namesake; the 27-year-old was gunned down in a Medellín bar just ten days after his autogol. Colombia beat Switzerland in their last group game at USA 94 but it wasn’t enough to allow them to progress to the next round, and a 16-year World Cup drought followed. Argentina thrashed Greece 4-0 in their opening game, courtesy of a Batistuta hat-trick and a stunning Maradona effort which was celebrated into the camera with now infamous wild-eyed gusto. Nigeria were overcome 2-1 in the second game thanks to a brace from Claudio Caniggia, before Argentina lost the final fixture 2-0 against Bulgaria. Following in the footsteps of Colombia, Argentina were defeated 3-2 by Hagi’s Romania and exited the tournament at the last 16. However, Maradona once again hogged the limelight after testing positive for a banned substance in the wake of the Nigeria victory. He would be sent home in disgrace, never to play for the national team again. Basile, who could perhaps consider himself lucky to have survived so long, left in the aftermath of the World Cup failure. El Cinco-Cero, as it is known in Colombia, is repeated every year on the anniversary of the game. But in terms of USA 94, the nature of the emphatic result could have been the worst thing to happen to a promising squad of players. Rumours were rife that the Colombian players celebrated their elevated status with a potent cocktail of women and alcohol, a mixture that has prematurely taken down many a promising young sportsman. The gruelling schedule of friendlies undertaken by Colombia in the lead up to the tournament didn’t help either, ensuring the players landed in the US in far from optimal condition. Andreas Campomar, in his 2014 book ¡Golazo! A History of Latin American Football, opined: “The autumn before, things had been very different. Colombia had been hailed as potential world champions. 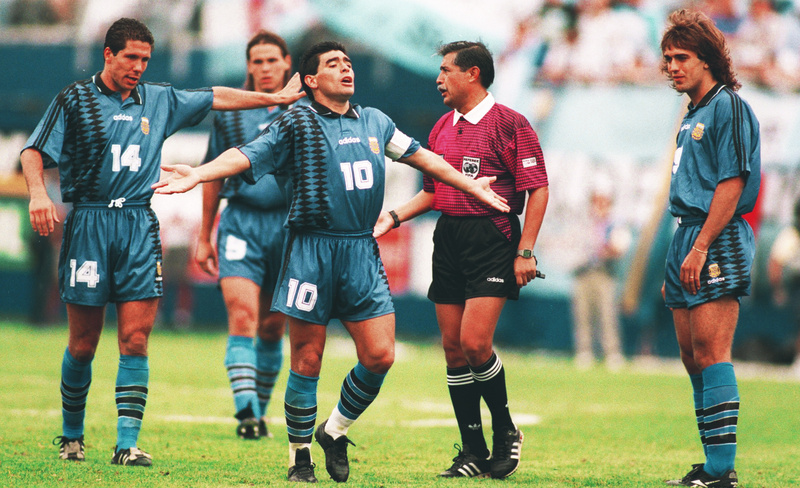 The country had become a victim of its own success.” Maradona, in his 2004 autobiography El Diego, labelled the result their “death certificate” and suggested the victory had gone to their heads. “They thought they’d entered the history books and in fact they’ve never done anything remotely like it since; quite the contrary,” he continued. To underline the magnitude of Colombia’s extraordinary achievement in September 1993, Argentina would go unbeaten at home in World Cup qualifying for another 16 years, until Brazil defeated them in Rosario. The same year – 2009 – would also ironically see the next five-goal defeat when Maradona’s men were trounced 6-1 by Bolivia in the high altitude of La Paz. Although Argentina came within a Gonzalo Higuaín boot of winning the 2014 World Cup, and reached the final of the 2015 and 2016 Copa América, they have not won a major senior international trophy since the summer of 1993, shortly before the 0-5 against Colombia. Has the result, one of the worst in the history of La Albiceleste, has placed a curse on the national team, subjecting it to eternal life in football purgatory? The night of 5 September 1993 will never be forgotten at either end of the South American continent for the massive shock factor it created and the legacy it left behind.